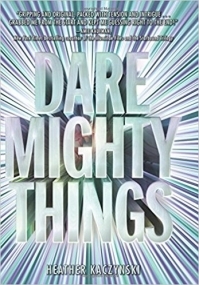 Told in first-person past-tense from a single point of view, Dare Mighty Things is a solid example of a YA/NA crossover. Cassie is 17 at the very beginning when she’s selected for a highly competitive secret NASA project. The story transitions almost immediately to her being 18—making her barely old enough to qualify, and the youngest to enter. The rest of her competitors (i.e. our side characters) range from 19-25. When I first read the blurb, I wasn’t expecting I’d be getting into a near-future speculative fiction piece. I was actually pleasantly surprised at that. Although as it turned out, easily 90% of the book felt very current-day--if one overlooks the background fertility crisis and accepted normalcy of designer babies. (Note: The fertility problem isn’t really explained, and the MC’s genetic engineering doesn’t actually end up bearing much if any significance to the plot.) So, if anyone’s worried about being overwhelmed by futuristic worldbuilding, don’t be! The STEM-centered material is well researched without info-dumping. The vast majority of the book centered around testing—lots of testing—while candidates are gradually paired down as they meet or fail a wide range of unspecified standards. To some extent, the eliminations make sense. (i.e. People showing less desirable or uncooperative behavioral patterns tend to be sent home.) But often decisions on who ‘wins’ a particular challenge is made on more nebulous, unexplained grounds. This point of contention ends up being the primary source of tension. To this reader, the process felt a bit drawn out. Ultimately there are only two who will be chosen—a primary and an alternate. And Cassie is single-mindedly driven to be primary. That brings me to Cassie’s character. She begins as a friendless, highly ambitious overachiever—a big fish in a little pond—whose only real desire is to go into space. She’s half-Indian American, which is woven quite seamlessly into the story with small cultural elements and even a bit of religion toward the end. She does show growth, being pushed out of her anti-social competitiveness into the concepts of friendship and even (sort of) romance. At one point a character even confronts her deficit in empathy and successfully brings about her self-reevaluation—which was great to see. Emilio was easily the most endearing character, and somewhat made up for how difficult it often was to relate to Cassie. The book takes a hard left into the more clearly sci-fi realm so close to the end, readers will already have the sense that this is more of a prequel to a larger story or extended series. Pretty cliff-hangery on the ending.